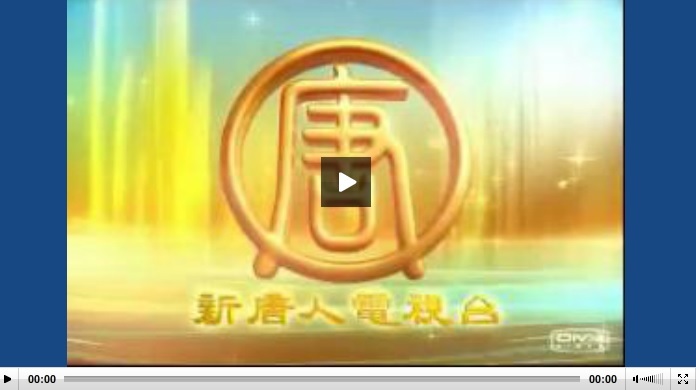 March 10, 2017: AABANY's March pro bono clinic covered on Chinese TV. October 30, 2017: Kin Ng, AABANY member and co-founder of the AABANY Prosecutors’ Committee, was mentioned in The New Yorker for his work at the Brooklyn District Attorney’s Office prosecuting scammers who had run off with the life savings of an elderly Chinese immigrant. 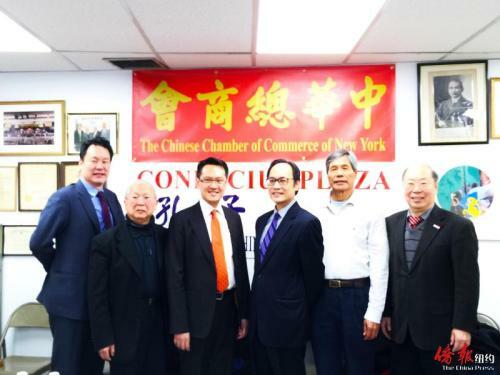 Please join AABANY in thanking Kin Ng for helping to protect those in the Chinese-American community who are vulnerable. You can read the full article here. October 17, 2017: Andrew Hahn, Partner, Duane Morris, and former AABANY, KALAGNY and NAPABA President, was interviewed as one of the New York Law Journal’s Distinguished Leaders of 2017. October 12, 2017: The China Press covered AABANY's monthly pro bono clinic, hosted by the Pro Bono Committee at the Chinese Chamber of Commerce in Confucius Plaza, in Chinatown. August 29, 2017: Theodore Cheng, AABANY member and past AABANY Board Member, was named one of National Law Journal’s 2017 ADR Champions. August 24, 2017: Amanda Bernardo, AABANY Immigration Committee Co-Chair, was named one of the 10 delegates to the Filipino-American Young Leaders Program (FYLPRO) 2017. Read an article from The FilAm magazine about her nomination here. August 2, 2017: Andy Hahn, former AABANY President, was interviewed by Bloomberg. 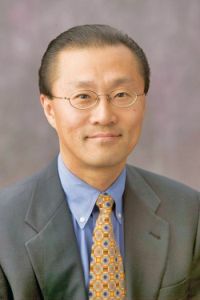 During the interview, he examined the obstacles that face Asian Americans in the law, from high attrition rates and underrepresentation to pervasive stereotypes and biases. August 2, 2017: Eve Guillergan, AABANY member, was asked to serve on Governor Andrew Cuomo’s Council on Women and Girls, the state’s first steering committee to recognize and advance women’s rights within our State. Read more about the committee here! July 7, 2017: Dwight Yoo, President of AABANY, was featured by the New York Law Journal as a newly elected Presidents of Affinity Bar Associations for 2017. July 5, 2017: Pauline Yeung-Ha, Co-Chair of AABANY’s Pro Bono Committee, was recognized by the Brooklyn Daily as a Woman of Distinction. The newspaper chronicled her journey from her start as an immigrant to the United States with her family to her achievements as the first member of her family to graduate from high school, college and law school. June 29, 2017: Kevin Kim, AABANY Development Director, was named to the Board of Trustees of The City University of New York by Gov. Andrew M. Cuomo. May 30, 2017: Several AABANY members are named New York Metro Women Super Lawyers and New York Metro Women Rising Stars in the New York Metro 2017 edition. May 22, 2017: Christina Nguyen, Career Placement Committee Co-Chair, was interviewed by Genevieve Antono from Ms. JD Pre-Law. Learn about Christina’s wonderful work as a volunteer coordinator and how she developed an interest in the law. March 27, 2017: Don H. Liu, Executive Vice President, Chief Legal Officer and Corporate Secretary of Target Corp., was the subject of an in-house counsel profile in the March 27 issue of the National Law Journal. For the full article click here (subscription required). On March 10, 2017, AABANY's March pro bono clinic got some coverage on Chinese TV. Read a translation of the article that goes with the video. Thanks to GSPI Committee Co-Chair Thalia Huang for the translation. 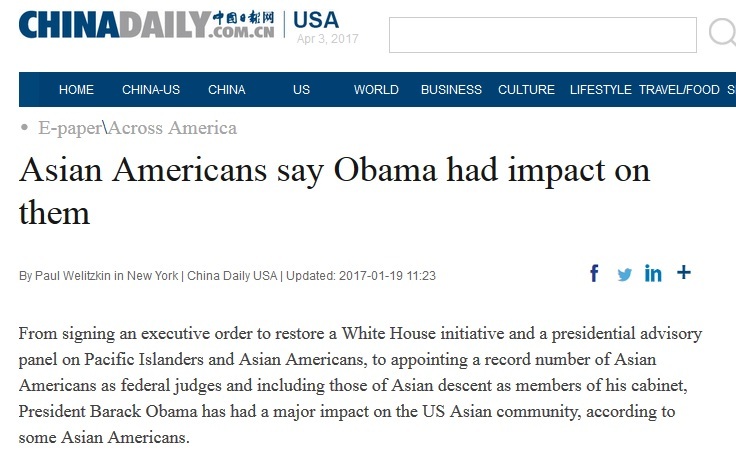 "President Obama also issued an executive order on diversity and inclusion within the federal government as related to the federal workforce and it had a big impact on Asian Americans who work for the federal government." Find earlier In the News postings in the archive. The best way to keep up with us is to come along for the ride!